The six-caste system has existed in Alsean society since before the first text was written. Established as an egalitarian division with each caste serving the other five, it was altered three thousand cycles ago when high empaths were claimed by the warrior and scholar castes. Now called the ruling castes, these two are the only ones that can put forth or vote for a candidate for Lancer, the planetary leader. Due to the caste system, Alseans place great importance on the numbers six and five. 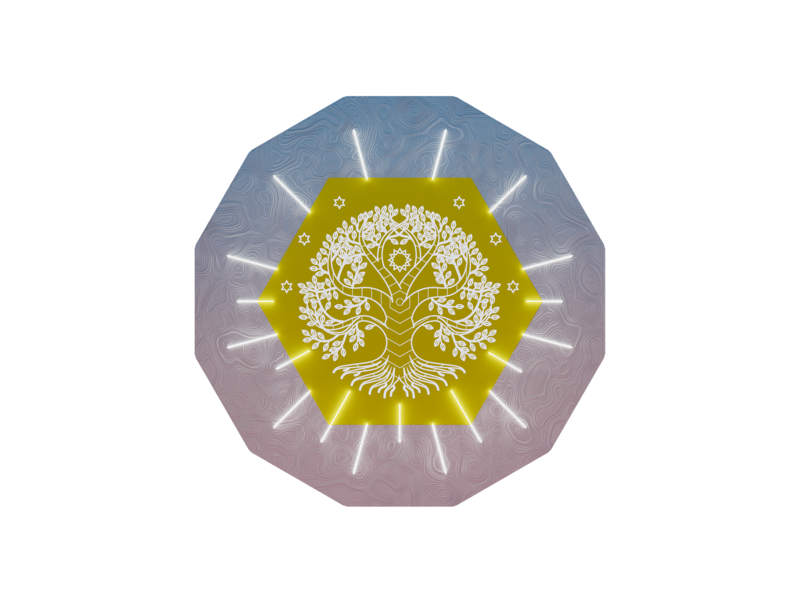 Caste shields all feature five stars and are five-sided. In more formal representations, they sit atop a silver ten-sided escutcheon. The one shield that features six stars and six sides is the Shield of Alsea; its more formal versions feature a twelve-sided escutcheon. With a culture so demarcated by numbers, geometry figures largely in Alsean iconography. Their caste emblems are built up from triangles, circles, and lines, which Alseans view as the basis of all things. Larger versions of the shields can be accessed from the Media: Alsea Art page. Warriors work in the protective services (firefighters, law enforcement, search and rescue) and tend to be found in jobs that are physically dangerous. As a caste they greatly value honor, and an oath sworn on their honor is considered unbreakable. Warriors are stereotyped as being arrogant, but they are also the most common protagonists in books and video entertainment. The warrior caste color is crimson red. 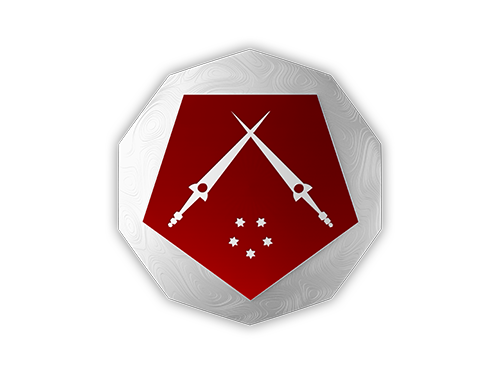 Its shield features a pair of crossed swords with five stars beneath the blades, signifying the five castes who depend on the warriors to protect and aid them. Scholars value learning above all else and are divided into two different but overlapping realms: secular and religious. Secular scholars run the schools, universities, research laboratories, and other institutions dedicated to learning. They are heavily represented in Alsean government. Religious scholars, known as templars, operate Alsea’s temples along with many of its government outreach services. Trained in counseling, templars often care for the mental as well as the spiritual health of Alseans. Most are philosophers at heart. Like warriors, scholars are often thought of as arrogant, not to mention out of touch with real life. At the same time, many parents pray to Fahla that their children will grow up to be scholars. The scholar caste color is dark blue. Its shield features a partial circle ending in an arrow pointing up and out toward five stars, indicating the search for knowledge and the duty to share that knowledge with the other castes. Builders are the designers and manufacturers, the engineers, the carpenters and stonemasons. They build and maintain the architecture and infrastructure on which Alsea depends. They are thought of as either dependable and honorable, or the laziest grainbirds that ever walked the land, depending on whether or not something has broken. The builder caste color is light blue. Its shield features a geodesic dome sitting above five stars, which represent the five castes who depend on the builders for roofs over their heads and roads on which to travel. The producers fish the ocean, grow the crops and raise the livestock that feed all of Alsea. As a caste they own vast tracts of land, but the wealth is not equally distributed. Landholders have a duty to provide for their workers, and all producers have a duty to their land whether they own it or merely work on it. They are caretakers, sworn to protect their resource and pass it intact to the next generation. Producers are stereotyped as extremely hard workers with a sometimes mystical tie to the natural world, but they are also looked down on as one of the least powerful castes. The producer caste color is a deep green, the color of life. Its shield features a stylized tree with five branches ending in stars: the five castes that depend on the producers for their sustenance. Merchants are the distributors and vendors, the caste responsible for the intricate web that moves products from the producers, builders, and crafters to those who wish to buy. In an overlap with the builder caste, merchants may run manufacturing and repair shops. They are often stereotyped for valuing profit over honor, yet merchants are the lifeblood of the villages, towns, and cities. The merchant caste color is purple. Its shield features a stylized balance for weighing goods; arcing over the top of that balance are five stars signifying the caste responsibility to deliver goods and services that the other castes need. The crafters are always thought of as a caste apart. They are the creative ones, the artists, musicians, poets, and jewelers. With the producers, they are one of the least powerful castes, but since they have little interest in politics or power, they don’t much care. Crafters are stereotyped as being lost in their art and sometimes difficult to understand, but are admired for the beauty they bring to the world. The crafter caste is unique for having not one but three colors: blue, green and yellow. It is said that in the dawning days when the castes chose their colors, the crafters in all their artistry could not settle on one. Their shield features two lines chasing each other to form a circle, which in turn is edged by triangles exploding outward. Thus it not only symbolizes the chaotic nature of creativity, but also features all three of the geometric shapes that form the basis of creation. Bracketed amongst the triangles are five stars: the castes who benefit from the artistry of the crafters. The symbol of Alsea is the molwyn, a black-trunked tree sacred to Fahla and made the central point of every major temple. In some representations the molwyn is orange and gold, representing the divine flame of Fahla. In others it is white, with the divine radiance shown in glowing lines. A subtle six-sided design is embedded in its roots and six main branches, echoing that of the shield itself. Above the tree are six stars. 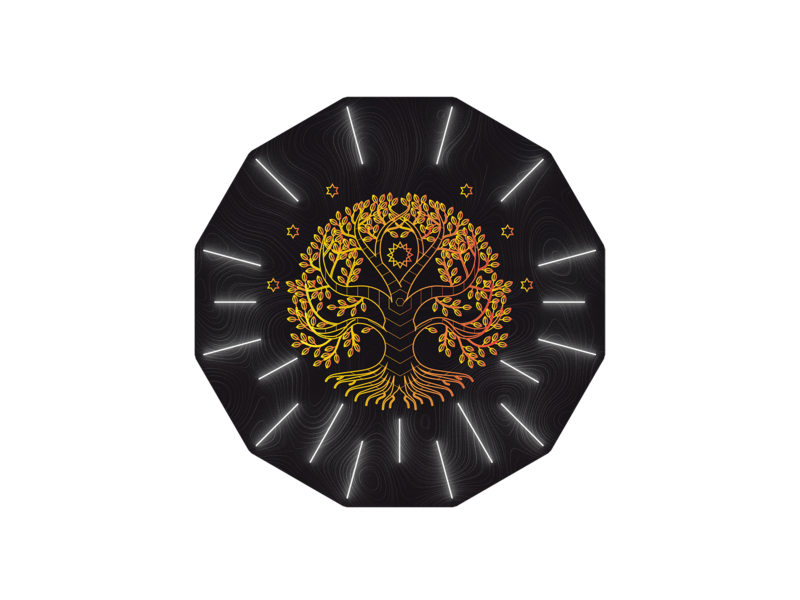 Stars, branches, and shield sides all represent the six castes, while sheltered in the branches of the tree is a single star, larger and more complex, representing Fahla herself. All Alsea maps and shield illustrations by João T. Tavares/GOBIUS.